You are at:Start Reading»Pregnancy»Diet & Fitness»Is Peanut Chikki Good During Pregnancy? Pregnancy is the blooming period of a woman’s life. It is a very special phase of her life and has its own dos as well as don’ts especially regarding her diet. The pregnancy diet as prescribed comprises of dried fruits and nuts, fruits and vegetables etc. Yet many mothers are perplexed with the question if consumption of peanuts chikki will result in any allergy for the unborn baby. Peanuts can be consumed in any form throughout pregnancy as they are a great source of folate as well as other vitamins and minerals. Peanut Chikki is a perfect substitute for chocolates. Let us now study what is peanut chikki, the process to make it, the nutritional content, how safe it is, if eating chikki can lower the chances of allergy to the unborn child, its health benefits, side effects, symptoms of allergy and the quantity that should be consumed in pregnancy. The healthy yummy and traditional Indian candy that is prepared with peanuts and jaggery. It is loaded with healthy and beauty advantages. It is a mix of important vitamins, proteins present in peanut and iron which is a majorly present in jaggery. This dessert is popular for its crispiness, aroma and the unique taste. Is Peanut Chikki Safe During Pregnancy? There’s no indication that consumption of peanut chikki will affect the baby or make the baby allergic. Yet pregnant women who have any allergies like asthma, eczema etc. should not consume peanut chikki. How To Make Peanut Chikki? Add 250 gm of jaggery with water in a heavy bottomed pan till the jaggery dissolves on slow heat. Keep increasing the flame and cook till the liquid becomes thick and shiny and dissolves completely. Once hot, add one drop of jaggery mixture to a glass of water at room temperature. In case the syrup turns hard then the consistency is perfect. Roast the peanuts and add it to the syrup and mix. Grease a plate and spread the peanut-jaggery mixture. Cool for an hour and let it become hard. Cut it into small square pieces and serve. What Is The Nutritional Value Of Peanut Chikki? Pure jaggery and peanuts are the main ingredients required to make peanut chikki. It is enriched with energy and has several health benefits. It is loaded with nutrients, antioxidants, minerals, and vitamins that are crucial for the optimal health. Peanut chikki is a good choice for the pregnant mothers. The combination has the benefits of both peanuts as well as jaggery. It is enriched with folate, protein, nutrients, minerals, vitamins, carbohydrates, fiber, fat, calcium, iron, magnesium, phosphorus, sodium, potassium, zinc, thiamine, riboflavin, niacin etc. Does Eating Peanut Chikki In Pregnancy Lower Allergy Risk For Child? It has been found out that the women who eat nuts and peanut chikki during their pregnancy have kids who are less prone to allergies to peanut products and peanut chikki. Yes, therefore, it is possible that eating peanut chikki during gestation helps the baby to contract nut allergy in future. What Are The Benefits Of Eating Peanut Chikki During Pregnancy? Great Antioxidant Properties: Peanut chikki is enriched with anti-oxidants. it is a good source of vitamin B, E, and fats which offer to protect the body against flu and other diseases. Peanut and jaggery also contain selenium, which plays a key role in metabolism. Regulation Of Cholesterol: Even though high in fat content, it helps to bring down the bad cholesterol level and enhance the good cholesterol in the body. 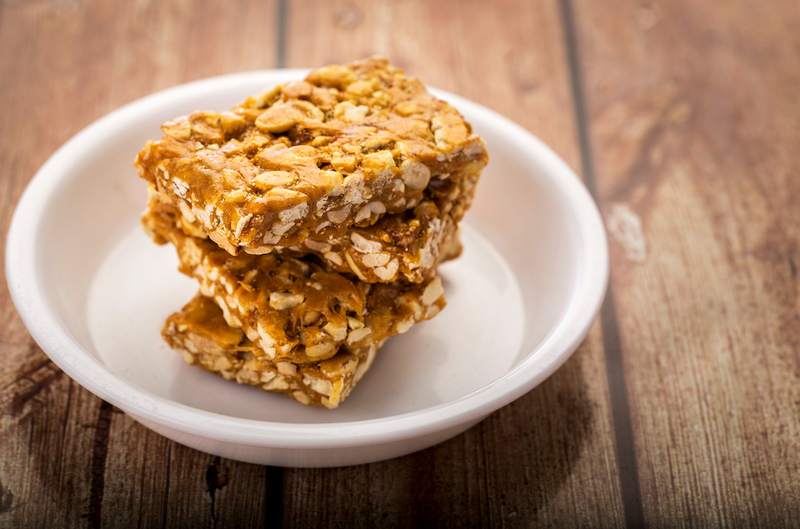 Good For Bones: Peanut and jaggery contains protein and calcium. This helps to enhance the dental health of the expecting mother. Protein and calcium are essential for the fetal growth as well. Heals Skin Ailments: Peanut chikki has a good oil content that helps to cure skin diseases and wounds. Controls Blood Sugar Levels: Gestational diabetes is quite common issues during pregnancy. A healthy dosage of peanut chikki will help in keeping the blood sugar level in control. Beneficial For The Nervous System: Peanuts are beneficial to help in combating sleeplessness, irritation etc. Enhance Blood Circulation: Both peanut and jaggery enhance the blood circulation. This will help in the healthy development of the fetus. Bone Development: Peanut chikki is enriched with manganese and it is crucial for the strong bone development. Helps With Digestion: Peanuts are enriched with fiber which helps in relieving constipation. It is important for the mother-to-be to have a daily dosage for smoothness of bowel movements. Heals Anaemic Disorder: Pregnancy is a phase where the body of the mother-to-be needs to produce more blood for supporting the growth as well as the development of the baby. Peanut chikki is a great source of iron and helps to cure anemia. What Are The Side Effects Of Peanut Chikki During Pregnancy? Risk Due To Consumption Of Stale Peanuts: It is advisable to not eat stale and expired peanut chikkis as they can lead to food poisoning. Toxic Effects Of Peanuts: Peanut chikki should be stored in cold places else they can get fungus. Eating this by expecting mother can bring about several health issues. Irritation In Stomach: In case of overeating, peanut chikki can bring about digestive issues and stomach irritation. Increase In Weight: Peanuts contains a lot of fat that can make you put on more weight than the required pregnancy weight. What Are The Symptoms Of Peanut Chikki Allergy? How Much Peanut Chikki Is Safe To Consume during pregnancy? Peanut chikki should be consumed in moderation, one should have few pieces at a time. Consuming it in excess can lead to weakness in the bones of both the mother as well as the baby. The chikki should be consumed as a snack and not as a part of the main meal. Thus, we can say that it is important for the pregnant women to have a full-fledged and balanced diet that comprises of fruits, milk, wheat, pulses, nuts, vegetables. Consumption of peanuts offer nutrition and major health benefits but it is always advisable to consult a doctor for the dosage. Previous ArticleBaby Born With Teeth – Is It Normal ?